Meon Junior School were thrilled to welcome Portsmouth South MP, Stephen Morgan, last week when he visited the school in Shelford Road, Southsea. Stephen was given an informative tour of the school by the House Captains, taking in all the facilities and gaining an understanding of the schools cognitive thinking approach. As part of The Thinking Schools Academy Trust pupils are supported to develop ‘thinking skills’, which help them shape their own cognitive habits to improve learning. After the tour Stephen spoke to the school in an assembly, giving the children an excellent opportunity to discover what MP’s do in parliament and how they represent their community. 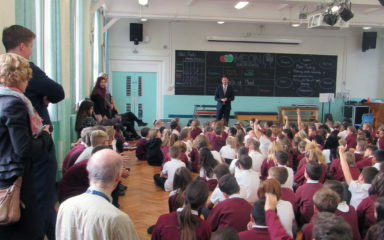 The children were then given a chance to ask Stephen questions where he faced a variety of topics including Brexit. 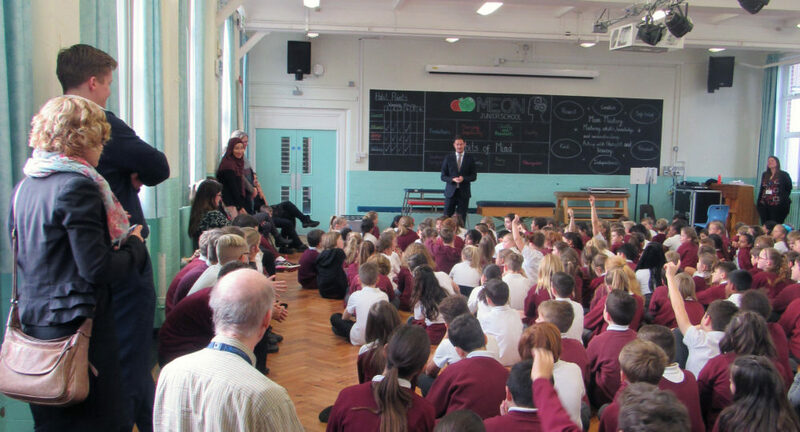 “It was a pleasure to visit Meon Junior School and join their assembly, meet teachers and pupils and hear about some of the issues that are important to them. “Going into local schools is really important to me and with our city’s schools set to lose £3.7 million under this government, my ‘Portsmouth Against School Cuts’ campaign continues to be a priority.